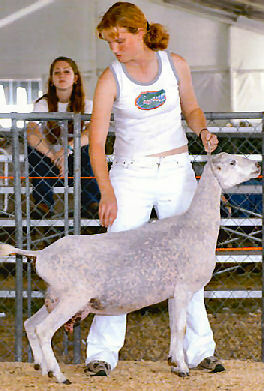 Skye was a January 2003 AI baby and was the first one that her dam "Cee" presented us with! She is very promising being extremely wide and powerful, smoothly blended and deep all the way through her rear barrel. She really reminds us of her dam at the same age. Skye was junior Champion at 3 months of age and also appraised Ec Ec V overall Ec on young stock LA. She was 12th place senior kid at 2003 Nationals out of 40+ kids. 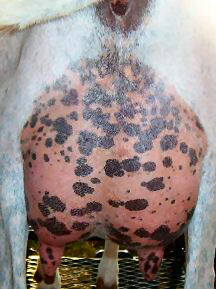 Skye kidded 2/17/04 with twin does and a beautiful mammary. One sold, one retained. Skye was sold this fall after battling an intense summer of persistant heat stress. We just felt that she would not be able to tolerate many more summers of our intense heat and humidity down here. We had retained her beautiful (and more heat tolerant) "Ec" daughter out of Conagher, Crystal, only to lose her in the fall of 2004. 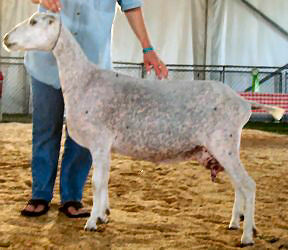 Skye was bred to One Oak Hill Cycas Homeboy and sold to Ashley Shaw in North Georgia. Skye's pictured here as a yearling milker one month fresh.